I have to backtrack a little bit because I forgot a curious little tidbit. I thought it was after my first PET scan, but looking back at what I wrote last week, it couldn’t have been so it must have been during session 4, back on October 17. Sorry, just momentary a case of chemo-head! It happens. I had asked Dr. David if it were somehow possible for me to see what my tumor looked like and he was more than happy to oblige. Out came his iPhone and after a few clicks, there it was in glorious black and white, the image from my original CT scan. 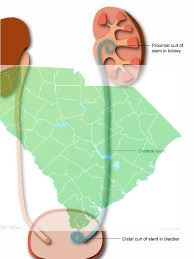 He pointed out my bladder and my kidney and the tumor, which, if I was looking at the correct image, looked to be in the shape of the state of South Carolina and it seemed to take up most of my mid-section. 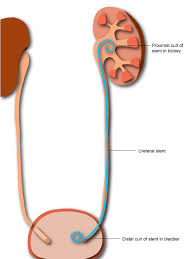 What puzzled me was how the stent fit between the bladder and the kidney. Well, first of all, I had no idea at that time what the stent looked like and I pictured it in my mind as a smallish object, maybe 2 inches or so, made of metal, that somehow pierced those two organs. I never questioned it, though that would explain the occasional pinch I would feel up inside. That’s a lesson learned, for sure. Ask questions. It was only later, after it was removed that I learned what it really looked like (and I posted a picture of it early on in this series). Here’s a composite of how I remember seeing the tumor on Dr. David’s phone, except it was shades of gray. Hmm, shades of gray, sounds like a great title for a book. 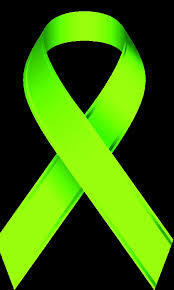 On Wednesday, December 18, I had my appointment with Dr. Clambake to have the stent removed. Everything was starting to get buttoned up on this chapter of my life, one step at a time. The receptionist at Dr. Clambake’s had said, over the phone, the procedure was easily done in the office and I couldn’t imagine such a thing, considering the ceremonious procedure to put it in, having to put me under and have me sign all kinds of waivers in case I never awoke from the anesthesia. Would they put me under again? Would I be awake? Would I bleed? Would it hurt? Knowing how it went in, I joked with whomever I felt discussing it with that I wish I could send “it”, meaning my “you know” ahead and have it taken care of. I stopped that joke when the nurse who was prepping me didn’t appear to find it amusing. Plus it was coming out, so why continue with it? After I got all through with all the requisite paperwork the nurse brought me into the room and had me empty my bladder and change into a paper gown but keep my shoes on so I didn’t slip on the floor. 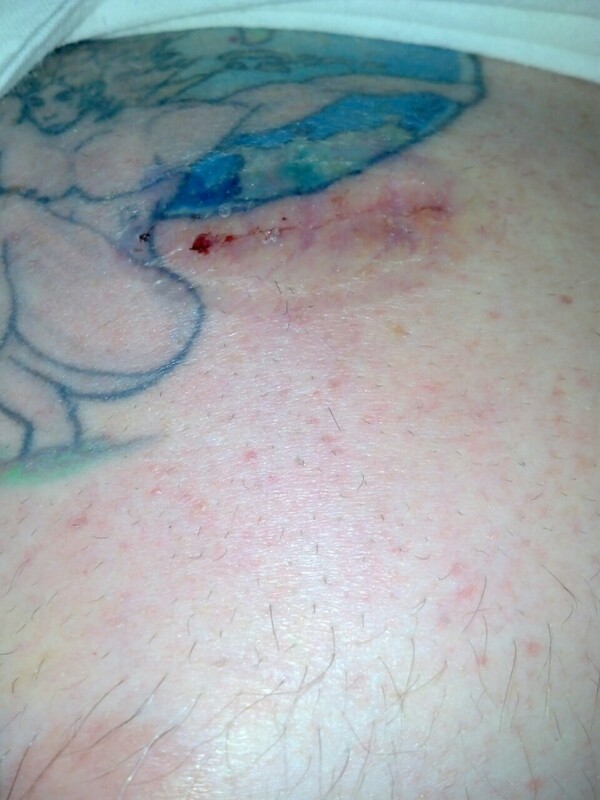 Then she explained what was going to happen on this very evening, that I might experience blood in the urine for a day or two, that I might have phantom sensations that the stent was still in there for a while. Great scare tactics! Enter Dr. Clambake, who appeared more towering and imposing than in his hospital scrubs back in August. Dr. Clambake became Dr Let’s Get This Done! But why wasn’t Nursey Nurse Nurse Nurse leaving the room? Oh no, don’t tell me she’s going to watch. Wait, he’s an accomplished doctor, he doesn’t need her help. “Lay back, Mr. Sigley”. Oh God, she IS staying and assisting. Oh God, she’s gonna see me naked. Then I heard them speak in medical jargon for a few and I felt something going on down there. I think she was holding the light, or the scope or playing Candy Crush, I’m not sure, but Dr. Clambake said “Okay, it’ll just be a minute” and I felt some pressure like I was going to, well, go and it reminded me of the story both my mother and my uncle always recount of the time when I was a baby and he was changing my diaper for the first (and probably last) time and didn’t realize he needed to cover my “area” because I got him good, like a Roman fountain. “Aaaand here’s your little friend,” Dr. Clambake said, dangling that 9 or 10 inch long piece of cord over me. “You’re done”. Do I need any antibiotics? “No, get cleaned up and dressed and go home. You’re fine! Nurse, give him a dose of “X” for pain. Call me if you need anything!” And there went Dr. Clambake to parts unknown. The entire actual procedure lasted less than two minutes, if it even took that long. I did as he said, took the pain pill when we got to a restaurant, Carrabba’s, for dinner, which also served a as a celebratory one. Hey, any reason for a party, right? I never did experience any ill effects except a minimum of burning during the first pee post-stent and I never did have any phantom sensations of it still being in place, but I guess they have to let you know what might happen so they’re covered.